Thanks to far.in.out for the instructions and to Wonko for the link. It works for Windows 10 x64. It may have been documented somewhere, but how do I write data/changes back to the vhd upon shutdown/reboot? I've followed the tutorial for using winram but i'v been blocked before ending of whole step. First, when i must install grub4dos the doc tell me that bootmgr file is C:\ folder but this file (bootmgr) and all these associate files and folder are in hidden part named reserved partition. So i Can't run the .cmd file because that show me an error "files unfinded". What going wrong with my computer ? i have forgotten somethink stupid step ? There are besides the index 6 files 01 to 06, which one contains the step you are having issues with? And/or which exact time in the video is the step you are having issues with? Copy grldr.mbr, grldr and menu.lst to the root of the partition where bootmgr is. Open the Install_Grldr.cmd file from the Grub4Dos folder for editing. The issue here is a "common" one. A number of Windows 7+ systems are installed (instead of "normally" with a single volume that is BOTH "boot" and "system") in to two volumes (that MS calls the wrong way around) and the first one (that is the "boot" volume, i.e. what MS stupidly calls "system") is later "hidden" and not assigned a drive letter. If this is your case, you need to (temporarily) assign a drive letter to it and thus mount it. Just wanted to say, thank you for this great tutorial. 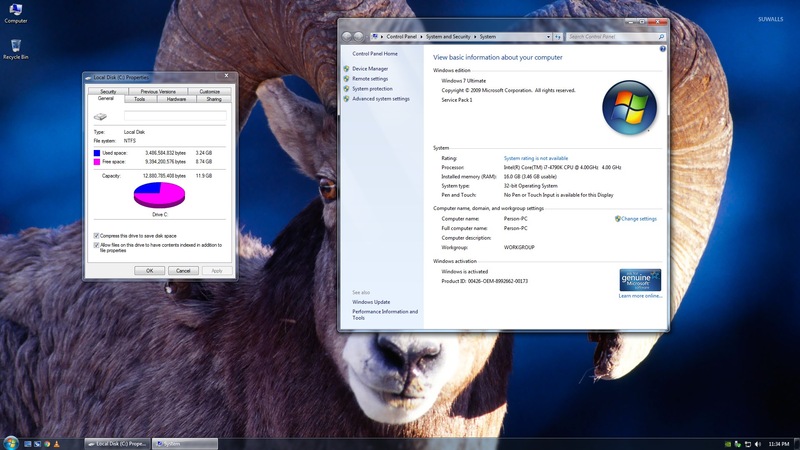 I made one of windows 7 sp1 ultimate lite in 8 gb of ram on a pc that has 16 gb of ram. So it means that you have 8 gb ram in this ram os to work with. 8 gb of rams takes 2 minutes to load into ram on a pc that has gb 16 ram. Because it runs in ram with every reboot your os is virgin again. Every app in this os reacts instantly, it is amazing. The os itself takes 5.1 GB of ram so you have allmost 3 gb of ram to install apps to. But again beware after a reboot these are gone, better use portable apps on this. But this 3 gb of free ram is what an os needs to run freely anyway. Edited by blackbalfur, 14 April 2018 - 03:58 PM. Could you please confirm if 32-bit programs work OK with the 8GB vhd. I faced problems a while back. Or if you would like me to try another app just ask me. Edited by blackbalfur, 14 April 2018 - 06:25 PM. Did you ever tried the alternative to the PAE patch (Product Policy)? I only have a crippled 64-bit W7 booting from memory because I thought I was restricted to a 3.5 GB VHD. Will try again and get a more useful 64-bit W7 booting from memory. What version of GRUB4DOS are you using ? 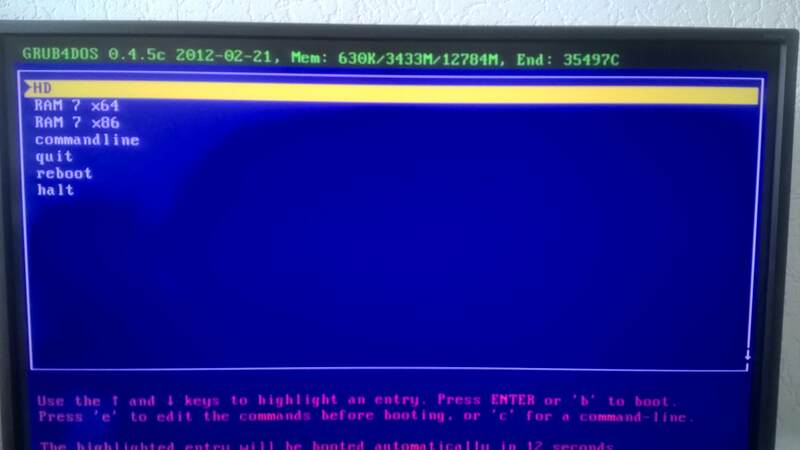 The VHD boots from hard disk OK ( using GRUB4DOS ). I used a 3.5GB VHD earlier with the same menu.lst and it worked OK.
EDIT : a 4.25 GB VHD loads OK into memory. I use the version in the package of this tutorial. But i will look for you. You run into a limitation of the amount of ram you can use i guess. Now i look at this picture i realize when the time copying to ram is not a problem i could make this version a 12 gb version. And still it will have its 3.46 gb of ram to use. It would have roughly 8.5 gb of free space to run applications/games in diskless. I think i will try this just to see if i run into limitations. Edited by blackbalfur, 15 April 2018 - 03:09 PM. 10.2 gb of free ram in this ram os and still it can use it's 3.46 gb of work ram. So now i do not know what the better ram edition is x86 or x64, you tell me. Edited by blackbalfur, 15 April 2018 - 03:40 PM. copying to ram takes 3 minutes. Now i have 8.74 gb of free ram space to install applications to. Edited by blackbalfur, 15 April 2018 - 10:22 PM. I'm still waiting for an explanation for this : if 32-bit programs can only access the first 4 GB of memory, how do they still work when a large VHD is loaded in memory ? The mem loaded VHD will occupy the first 4GB so the available free memory will be above 4 GB. Anyway to 'clear' the chipset memory hole ? The number of ram copied to memory acts like a normal hd. I have 16 gb of ram. There is a reason i made it a 12 gb version so that it would not touch its 3.64 gb of work ram. The first 4 gb of ram is still the "first" ram after you copied the 12 gb of hd space that acts like a normal hd. The x86 operating system sees 16 gb ram but can only acces 3.64 gb ram. So the fact that you copied 12 gb of hd space into memory does not change the fact that it sees 16 gb and can only use 3.64 gb. In this way we use the unusable ram of an x86 operating system on a pc that has 16 gb (or more) of ram. Edited by blackbalfur, 16 April 2018 - 11:41 AM. Tried it on my 'test' PC with 8GB memory. Win7 32b installed to HDD. Worked OK. Thanks for the tip. note : the modified X:\Windows\System32\config\system is saved as system.bak, needs to be renamed to system before booting. EDIT : When I booted it up today, the values had reset to the original values - no >4GB memory. What is the size of your VHD ? Did you create it using VHD Compact 7 ? Ideally the value should not have reset coz you are booting into RAM, unless you booted it as a filedisk where changes are persisted. When / how are the values reset ? Which component or program in WIndows does that. The PC I tried it on is not even connected to the net. You either disable the service, or run it from RAM all the time. In case you decide to boot it as a filedisk i.e, changes are persisted, then you will have modify the using ProductPolicyViewer. I have figured out how to boot a 32 bit WIndows 7 into RAMDISK on a computer with 8GB of RAM. Since the 32 bit Win 7 OS cannot access more than 4GB of RAM,it was not possible to boot a 3900MB (one of the dropdown options in VHD_W7_Compact) VHD file into RAMDISK. Edited by blackbalfur, 19 April 2018 - 03:02 PM. 32 bit Windows 7 failing to see RAM beyond 4GB. Hence if I RAM load a VHD with 3900MB, then the OS would be left with only ~100MB( 4GB - 3900MB) which is insufficient. In this scenario the Product Policy Tool helps by enabling Windows 7 to access the RAM beyond 4GB. Grub4Dos fails to load a VHD greater than 4GB on my computer with 8GB of RAM. Hence I created and used a 3900MB VHD. I am dumbfounded as to how you got Grub4dos to load a 12GB VHD on a computer with 16GB of RAM. Can you post a photo of the Grub4dos Menu on your Computer with 16GB of RAM ? I will redo my trials and post the exact errors. I will make a video with my phone to let you see how it works on my side. Edited by blackbalfur, 19 April 2018 - 04:27 PM. Edited by blackbalfur, 19 April 2018 - 05:23 PM.